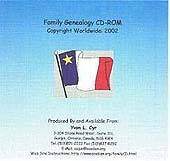 Today we announced the online release of The Acadian-Cajun Family, a database of more than 1.2 million records developed by Yvon Cyr over the past ten years. Yvon is a remarkable person who, after enduring a lifetime of incredible challenges, remains committed to his heritage and helping others trace their Acadian ancestors. Being able to collaborate on an online offering of this information was a wonderful opportunity. Read our press release, “Tracing Acadian-Cajun Roots for Genealogists“.